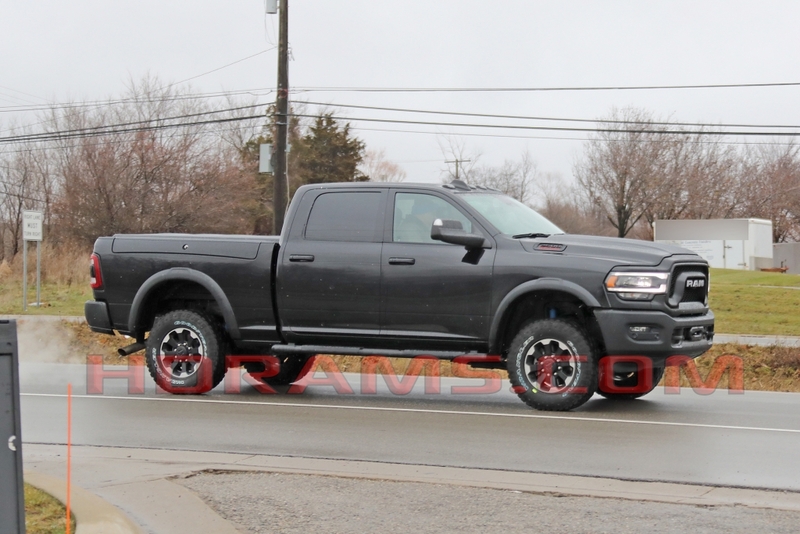 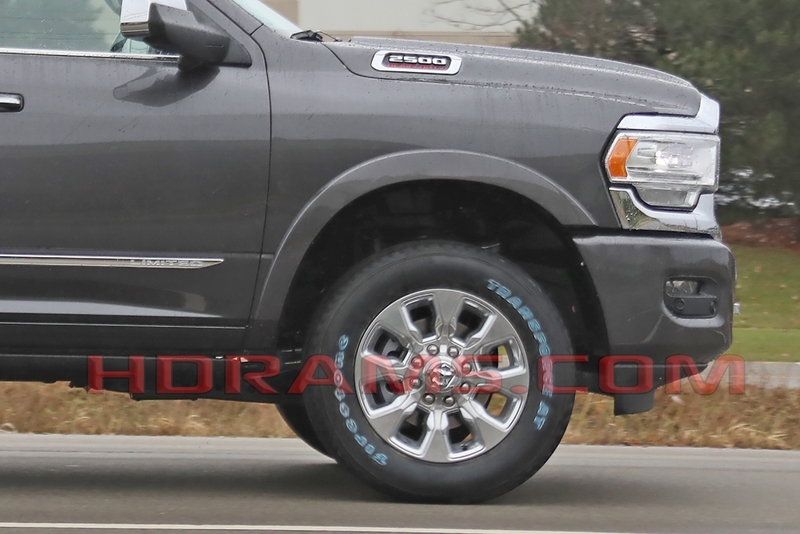 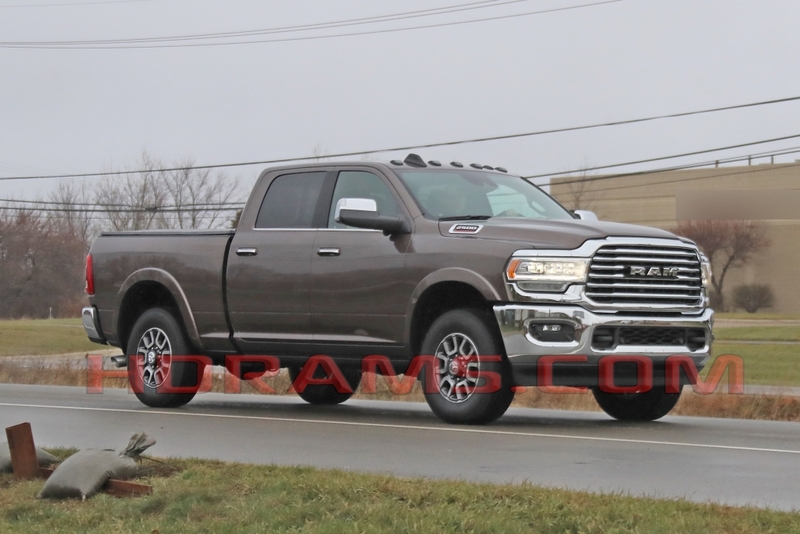 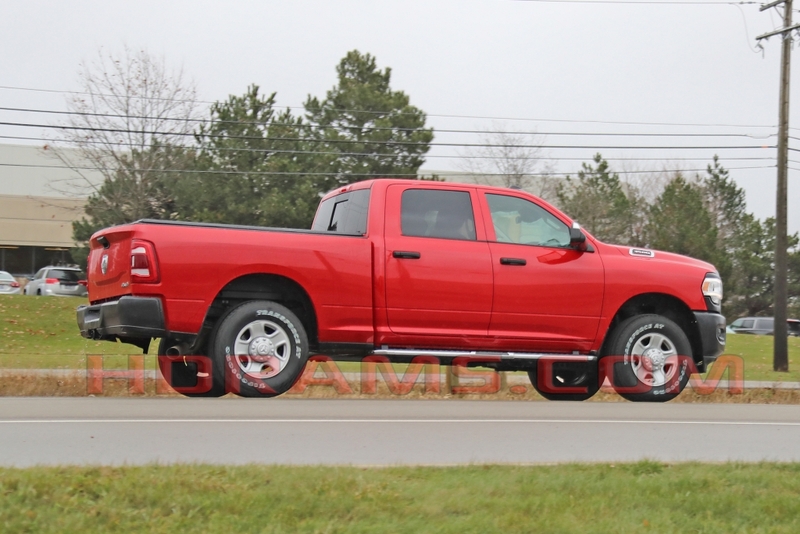 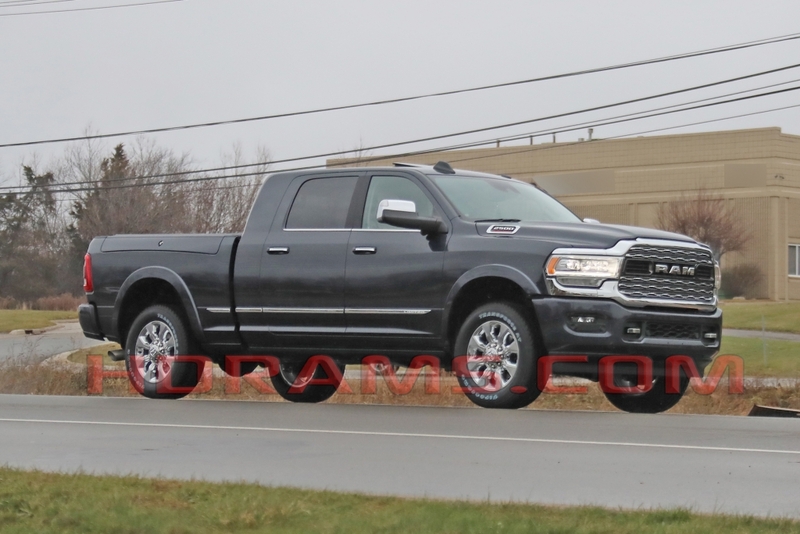 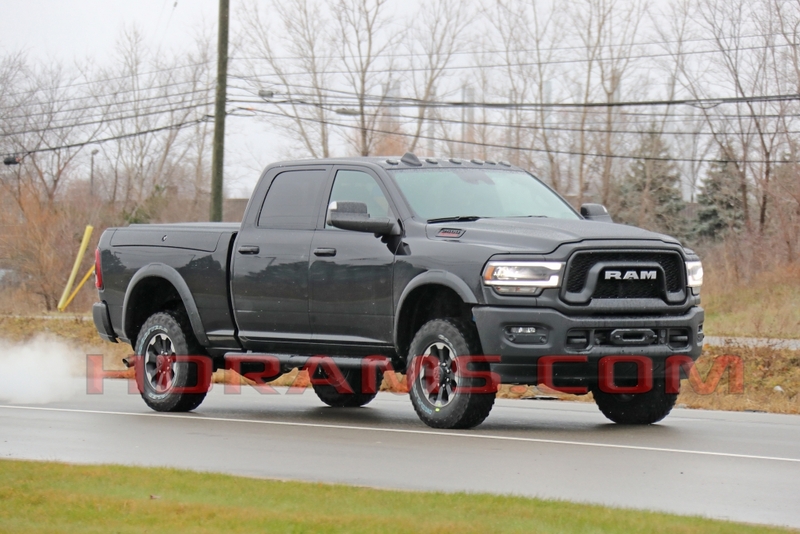 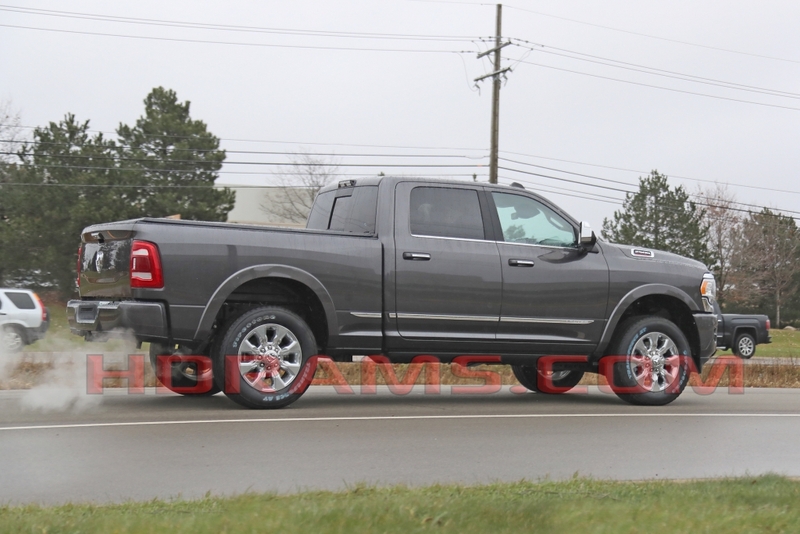 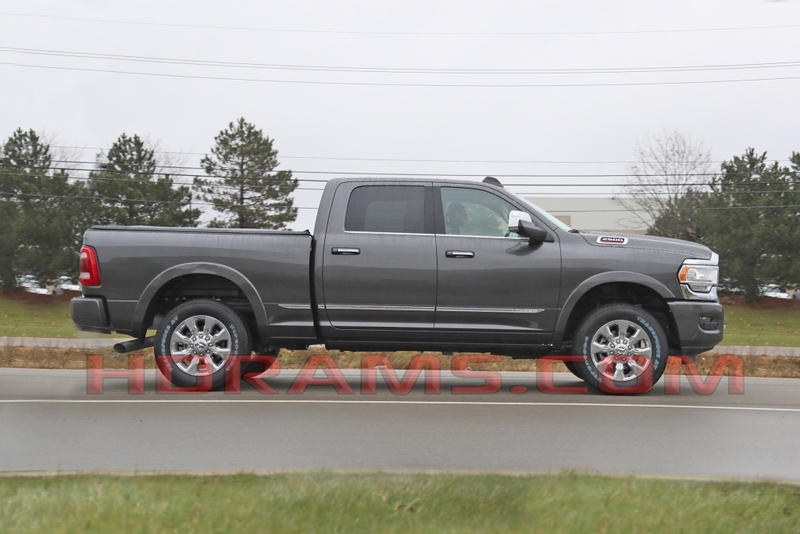 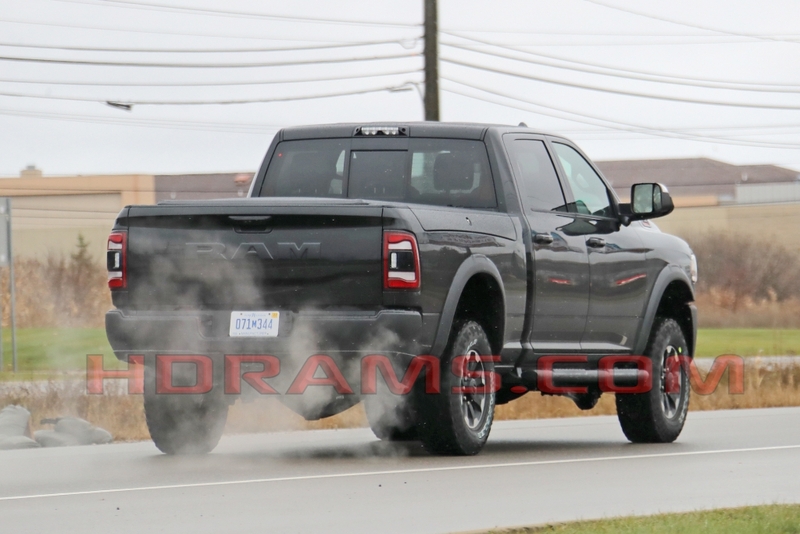 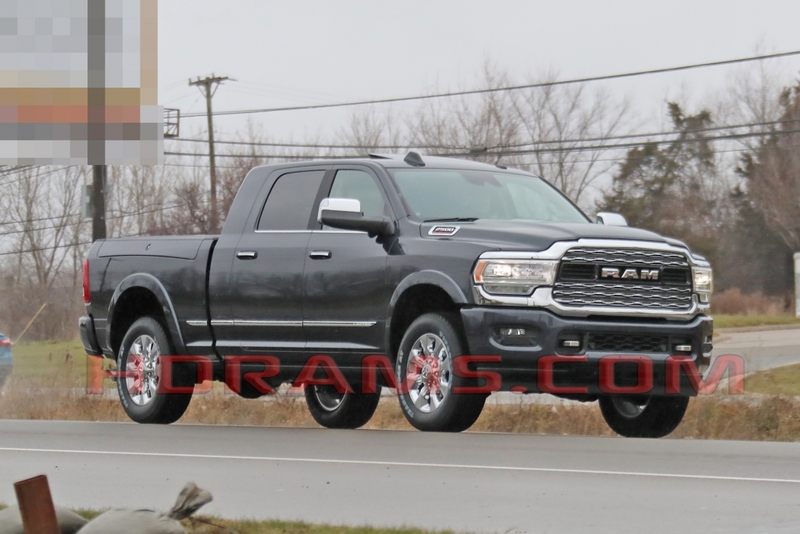 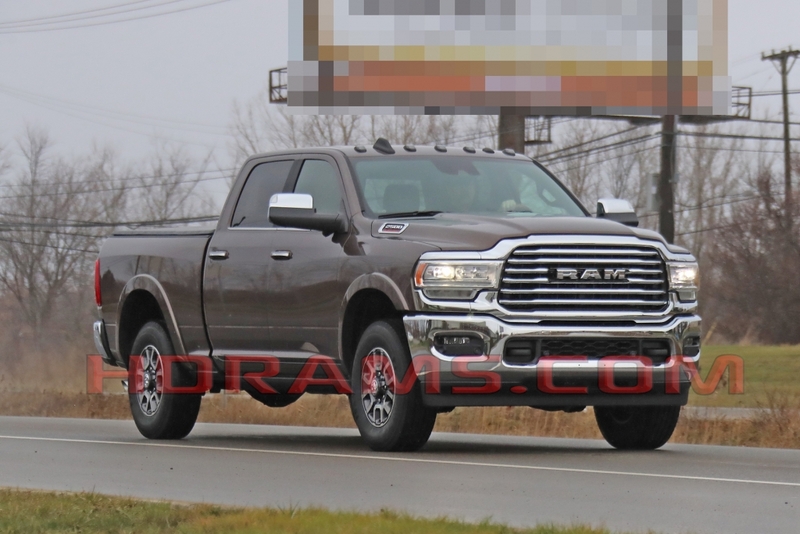 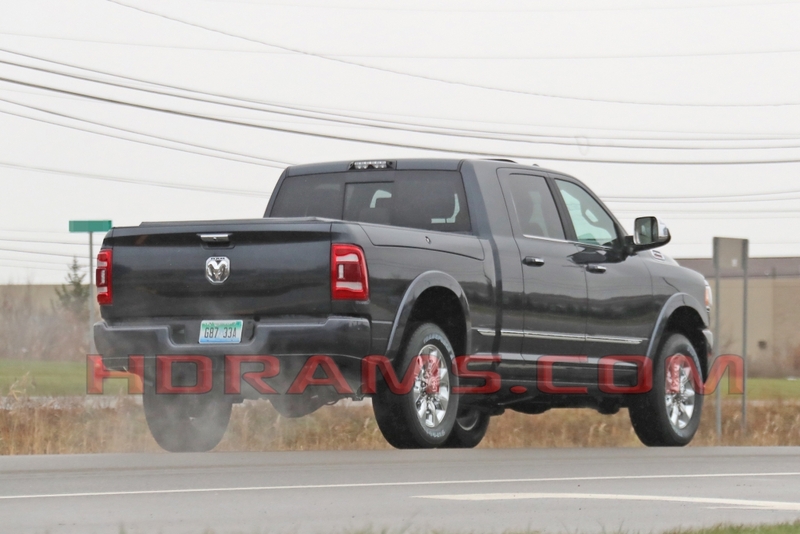 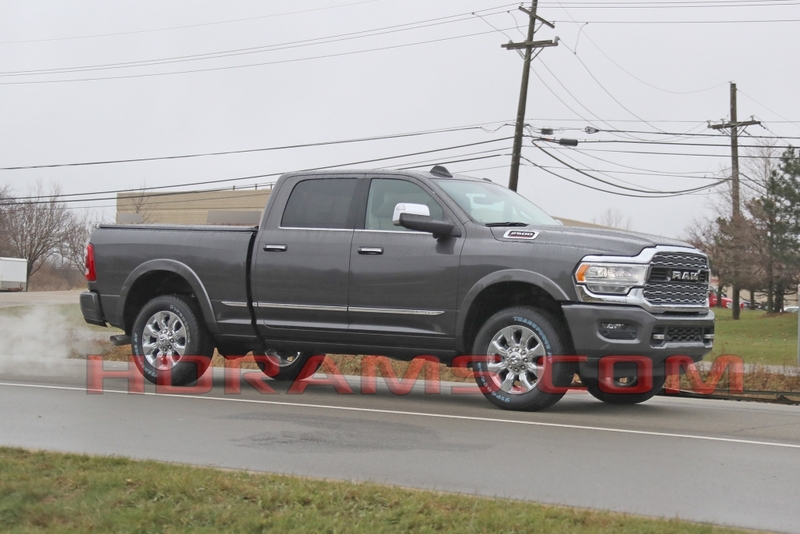 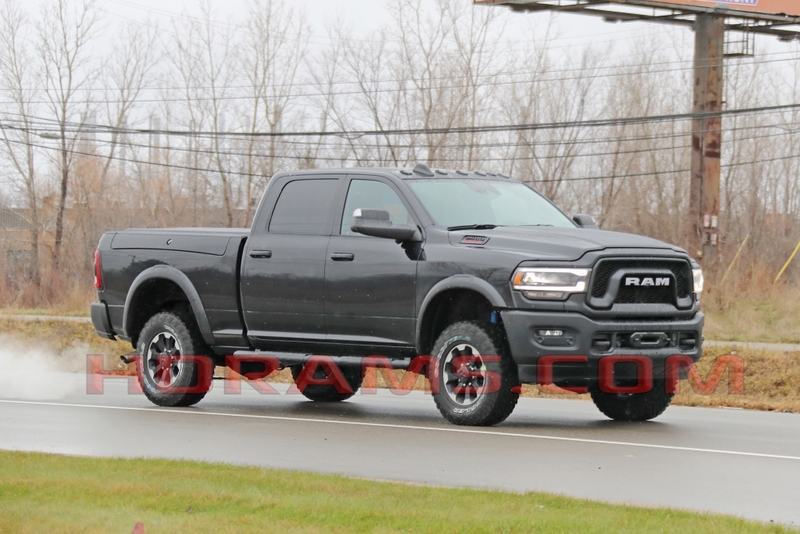 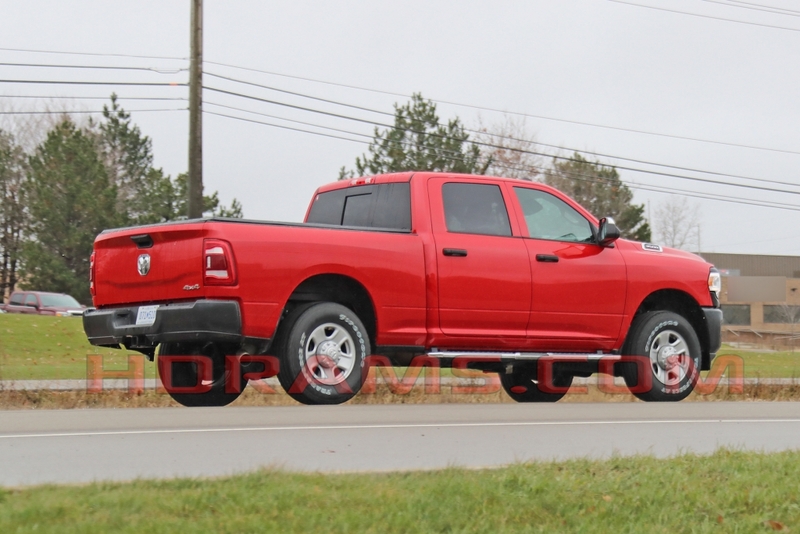 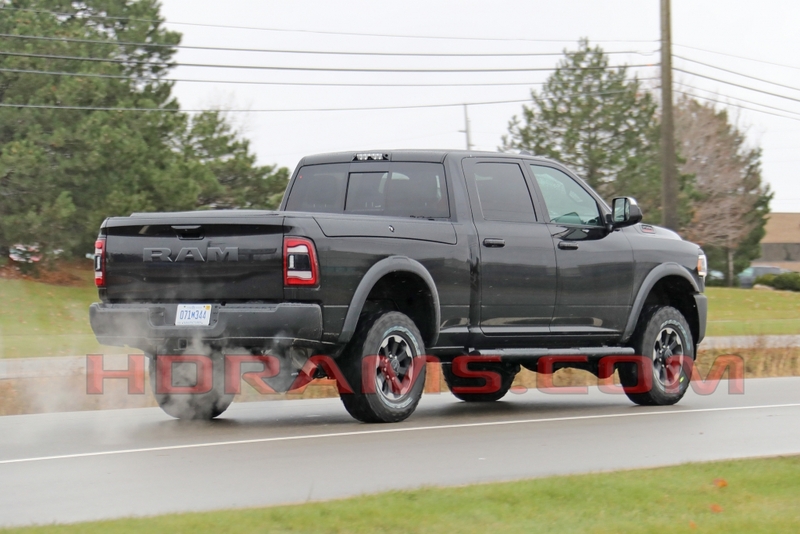 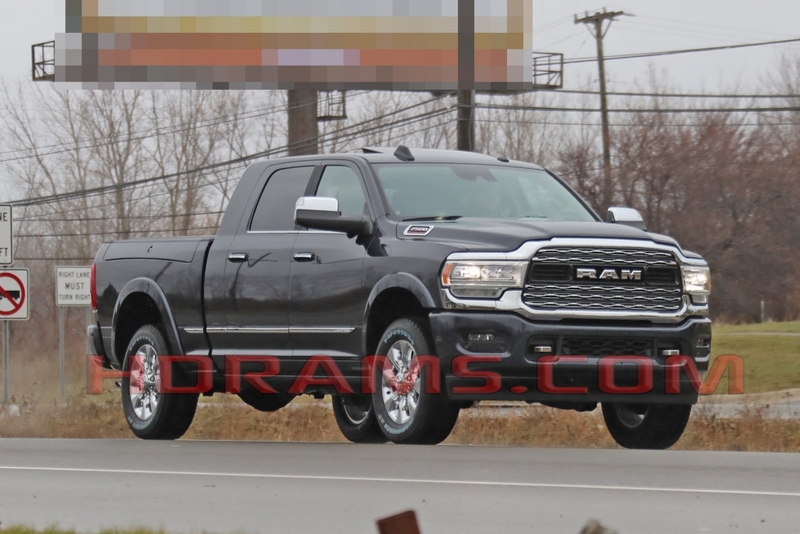 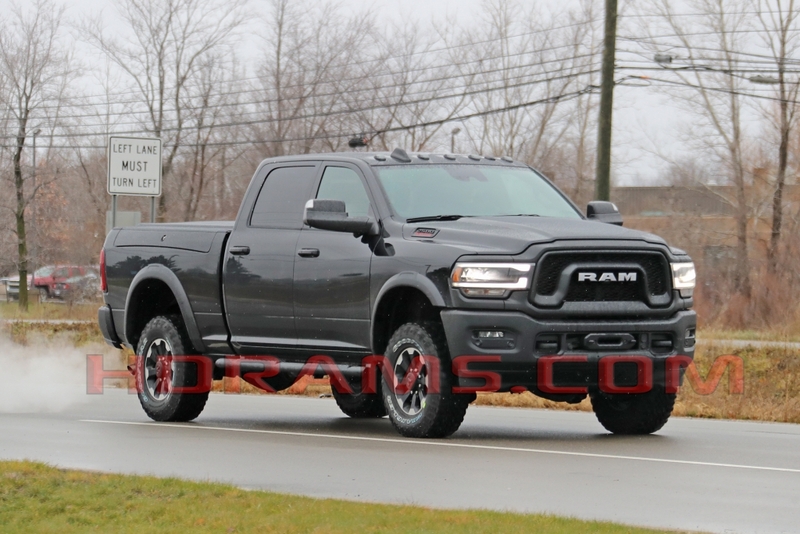 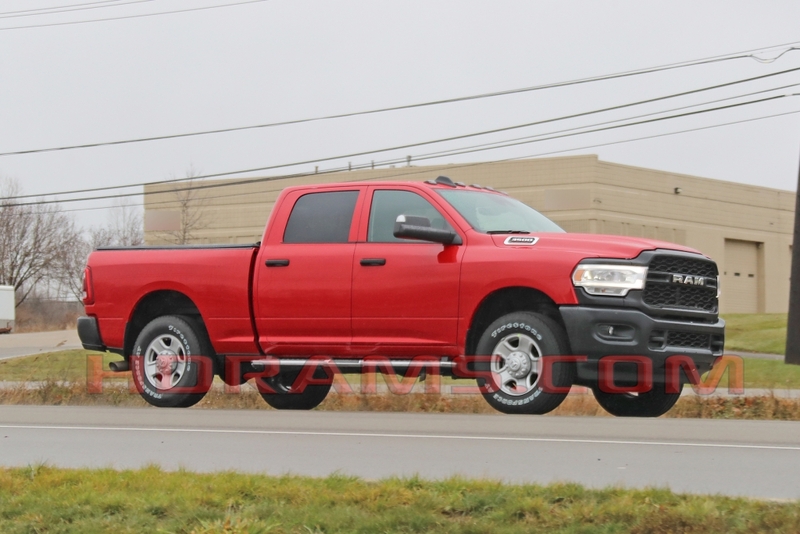 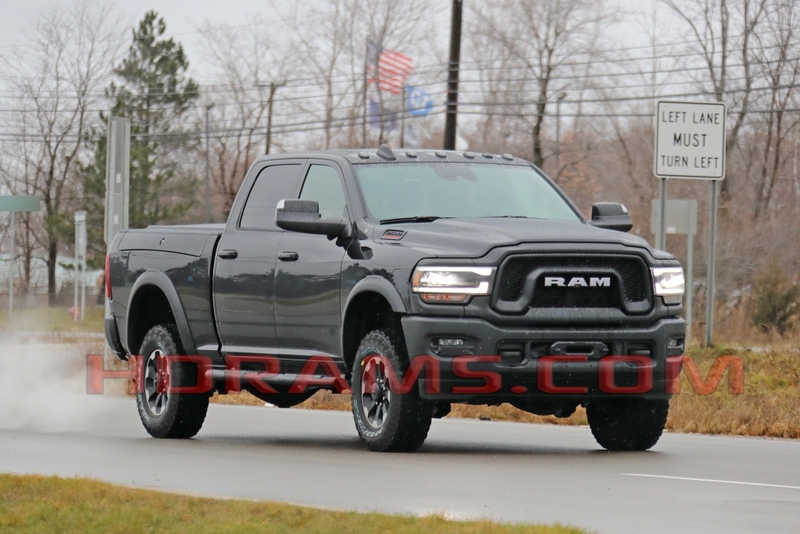 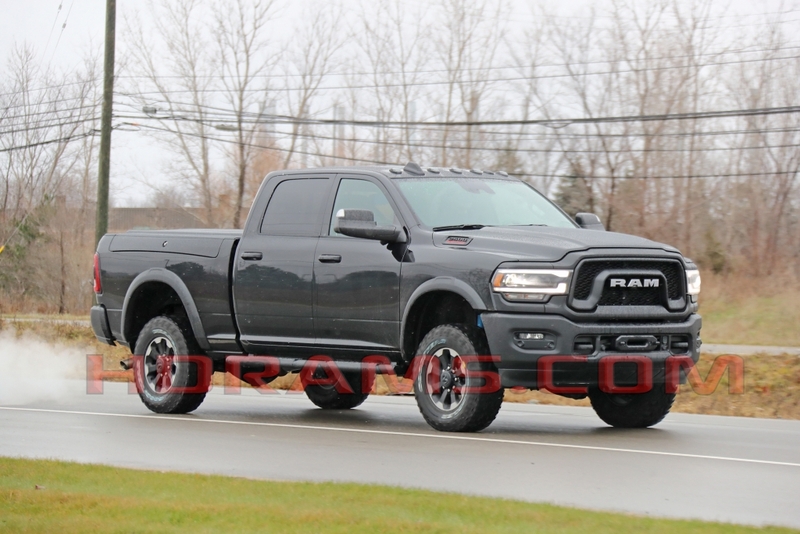 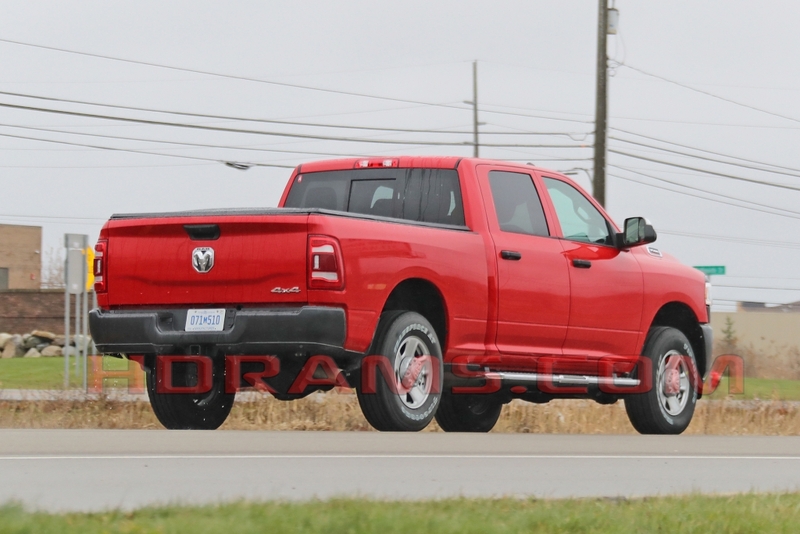 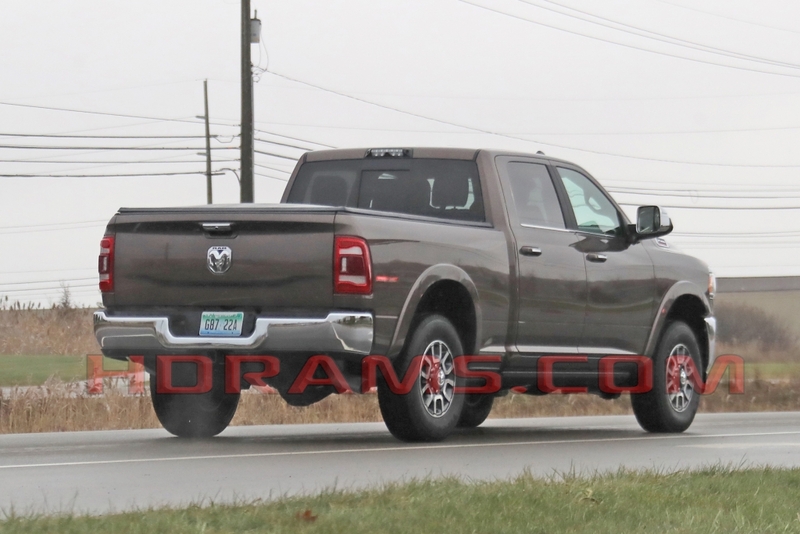 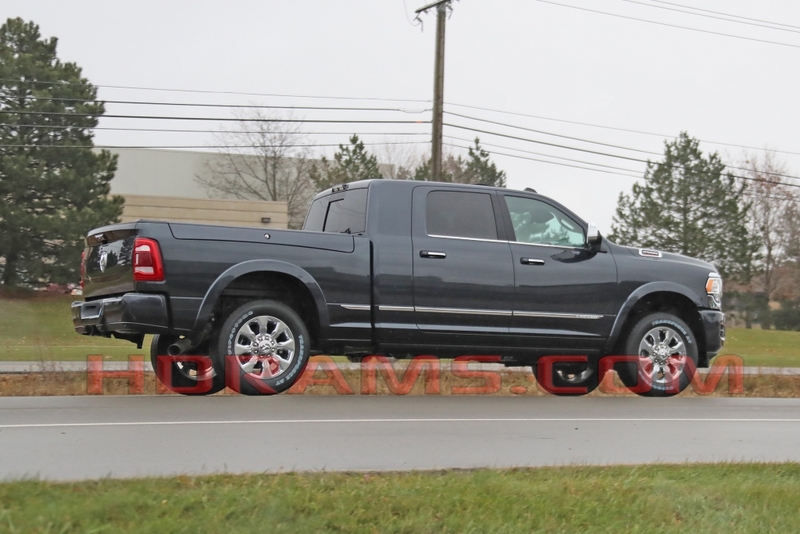 Late last weekend a few photos leaked of the 2019 Ram Power Wagon sitting outside a grocery store in Metro Detroit, and just yesterday we got more spy photos of that same un-camouflaged Power Wagon. 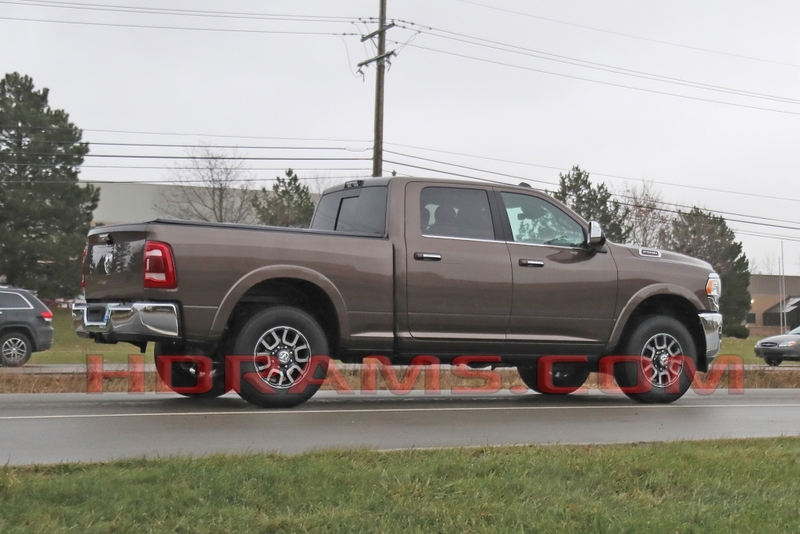 Today thanks to our Friends at Spiedbilde photography we have photos of other 2019 HD trims way before you’re supposed to see them. 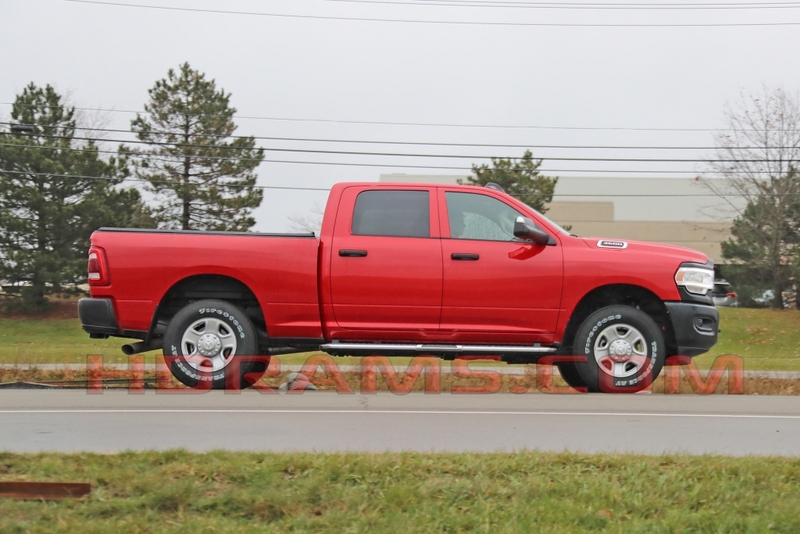 This Limited Mega Cab shows off its updated styling cues that bring the Heavy Duty trucks more in line with the brands styling direction. 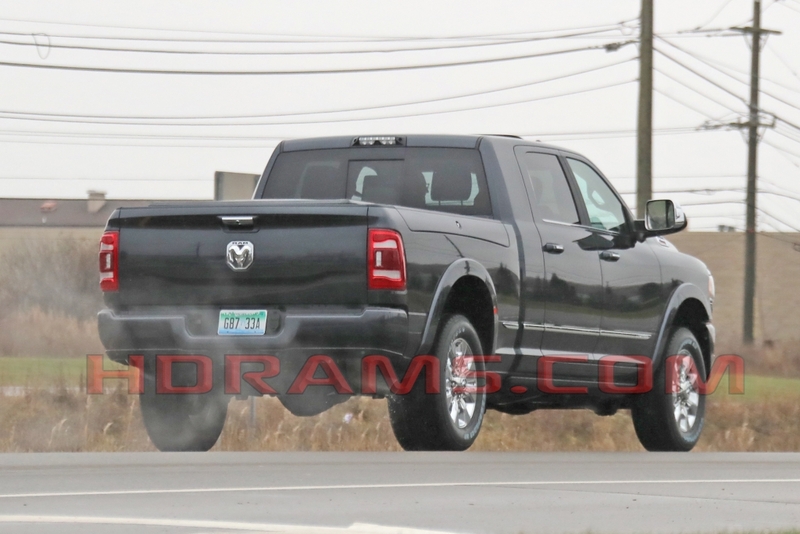 The sheet metal is new from the A-pillars forward. 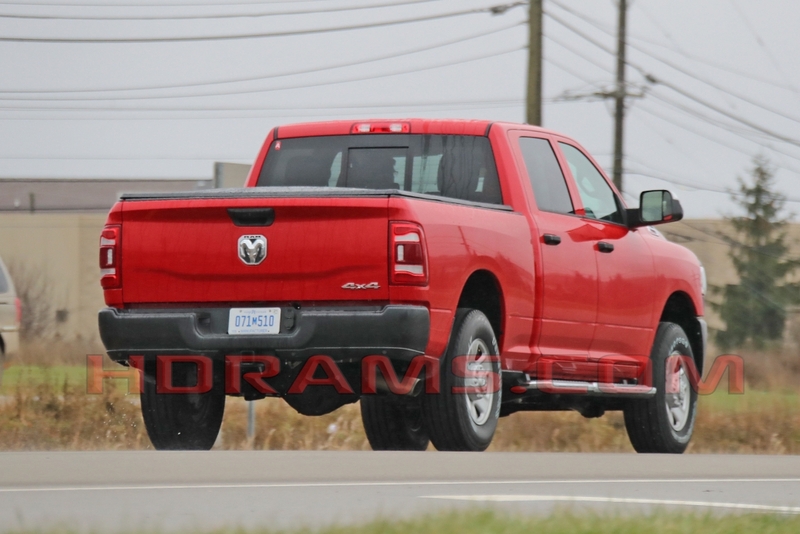 A newly designed hood now houses the badging as opposed to the doors and ties in the with new upper grille surround. 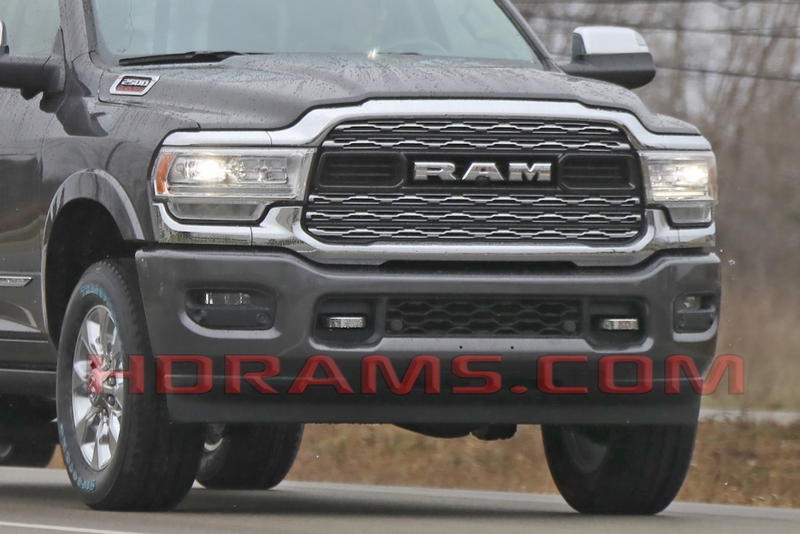 A new “razor wire” mesh design grille bears a family resemblance to the 2019 1500 Limited. 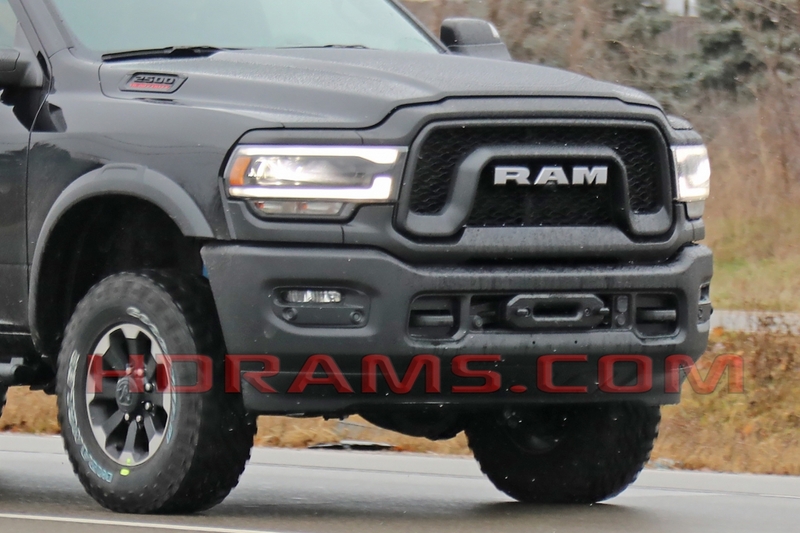 If you look close enough you can see a forward-facing camera mounted under the A in the RAM grille text. 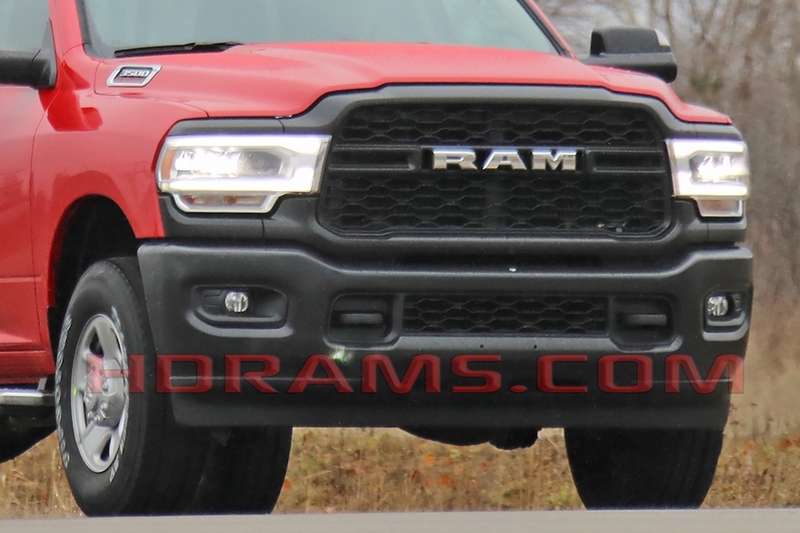 The lower grill surround looks like it houses a cold air intake such as the one on the hood of the GM heavy duty trucks. 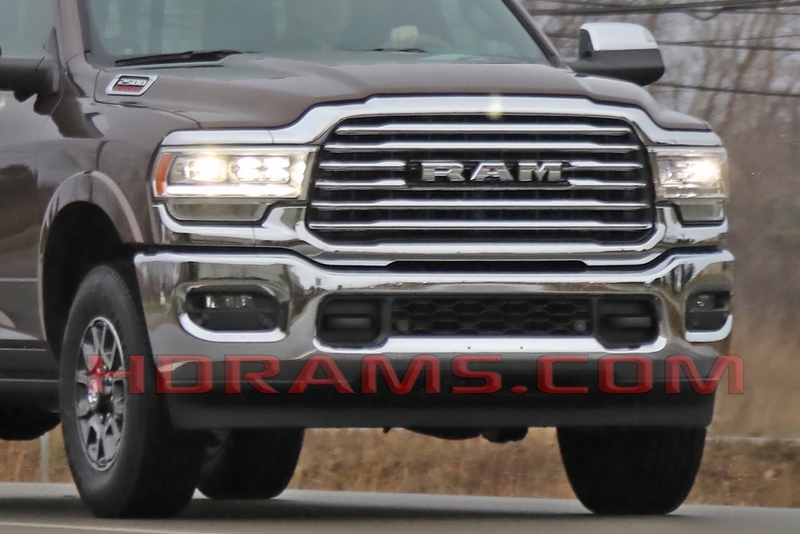 The new front bumper houses LED fog lights, chrome tow hooks. 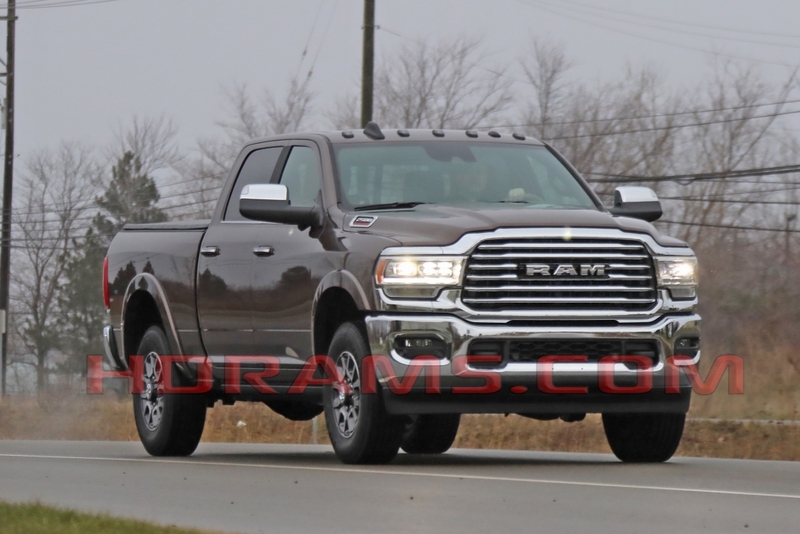 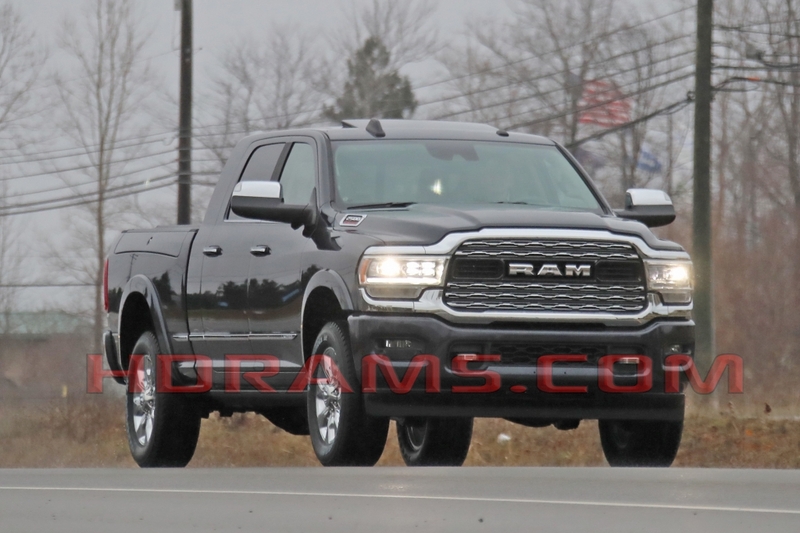 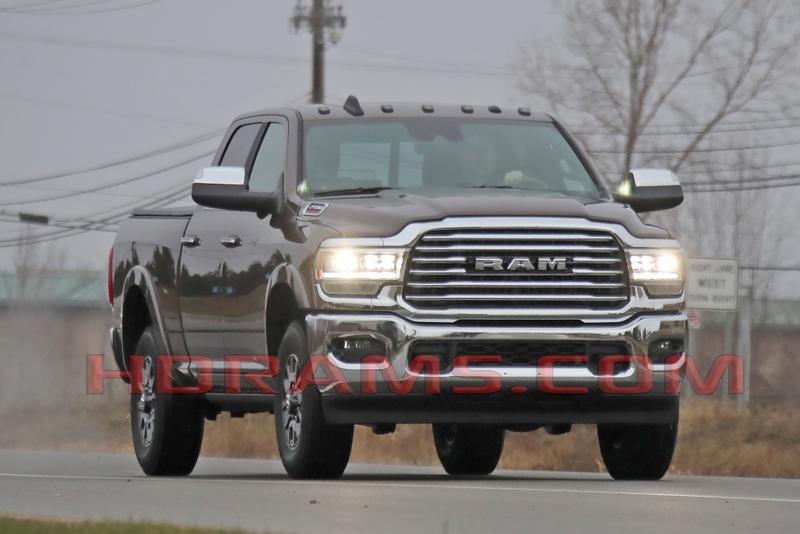 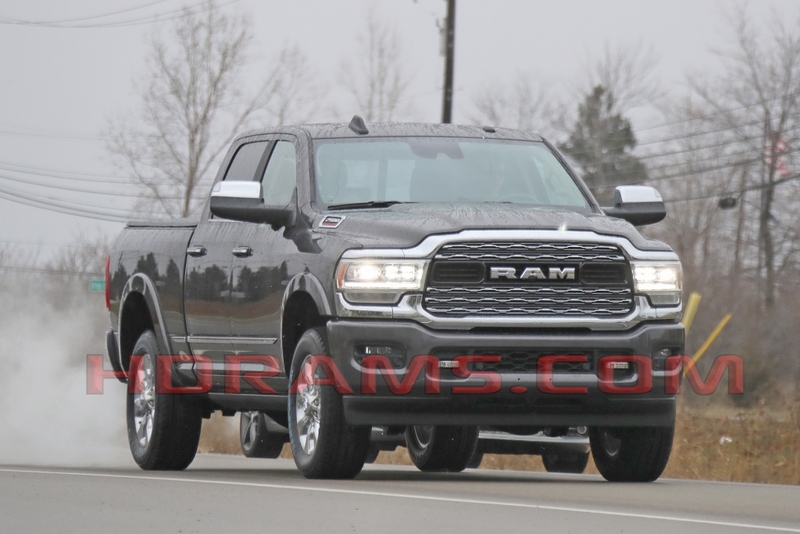 The headlights look to be specific to the Longhorn and Limited and appear to be full LED with the adaptive front lighting system that debuted on the 2019 Ram 1500 Longhorn and Limited. 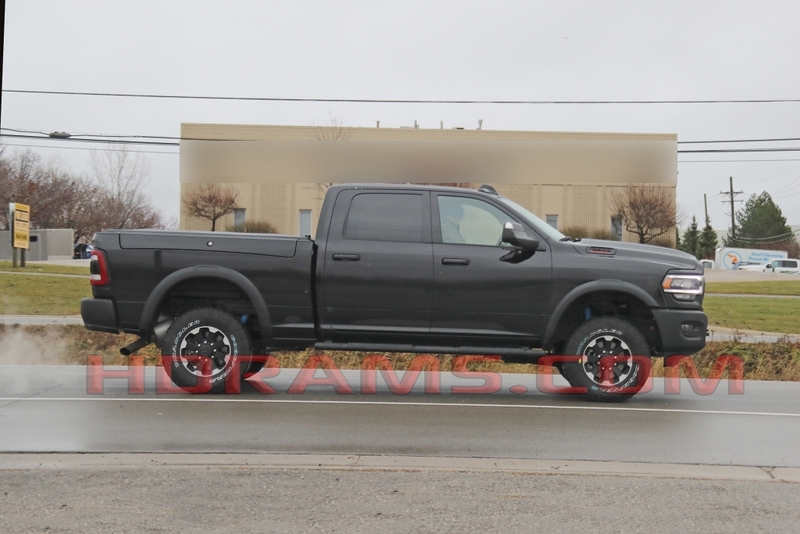 The adaptive front lighting system allows the headlights to turn with the steering wheel for better night vision. 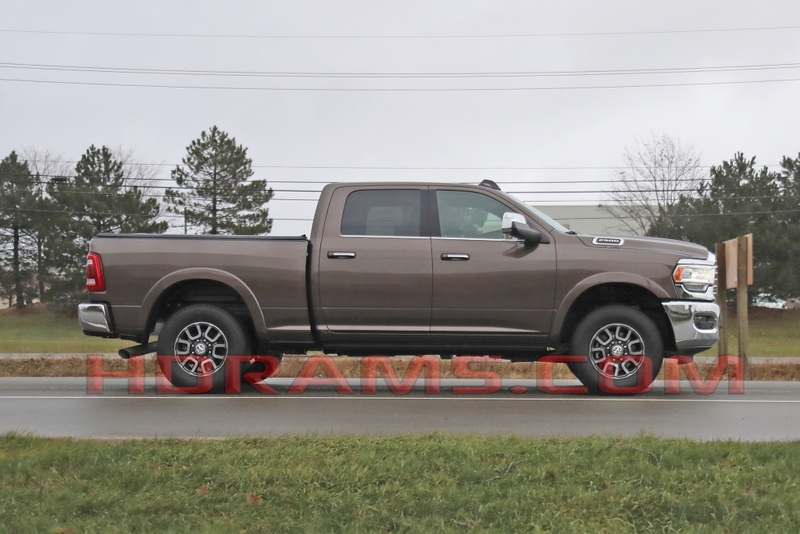 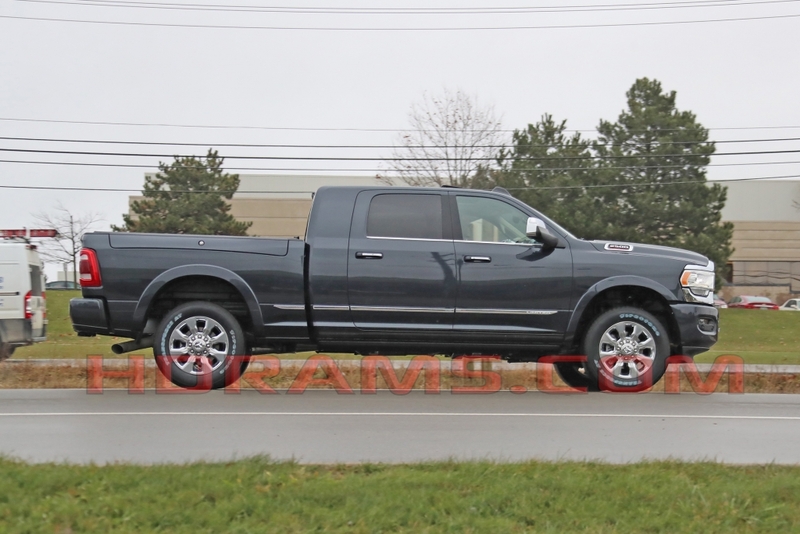 Looking at the rear of this 2019 Ram 2500 Laramie Longhorn we see more styling cues inherited from the 2019 Ram 1500. 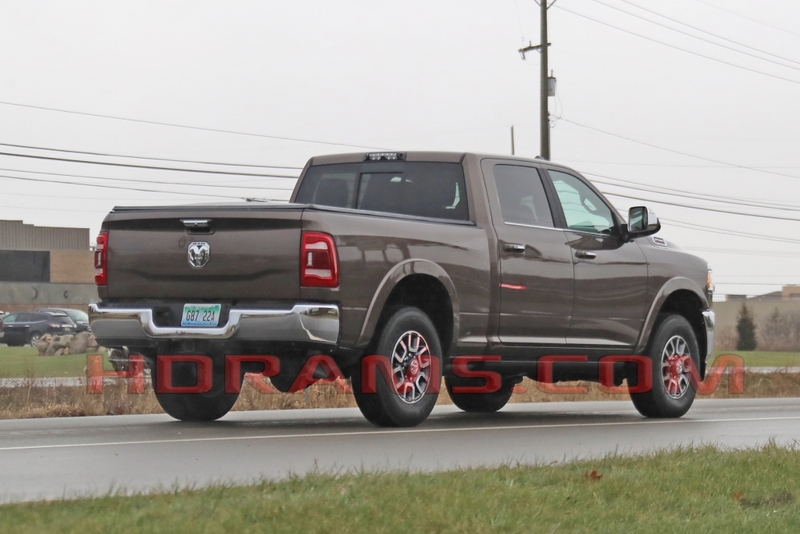 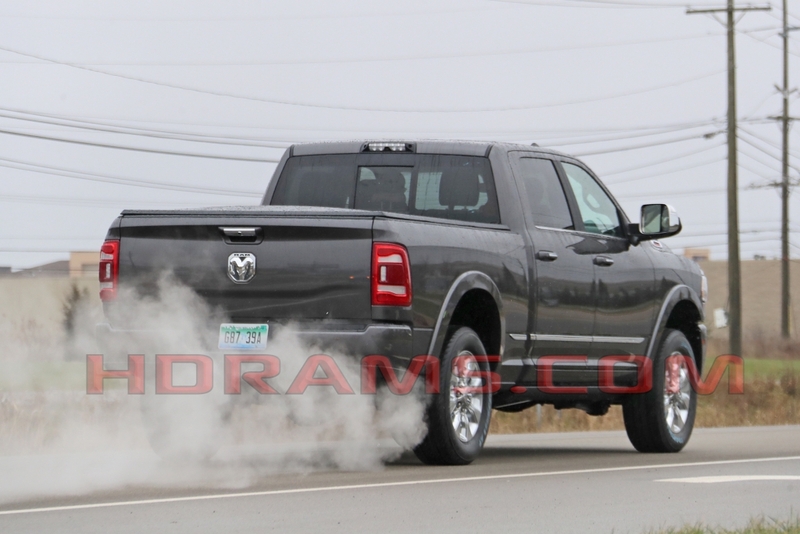 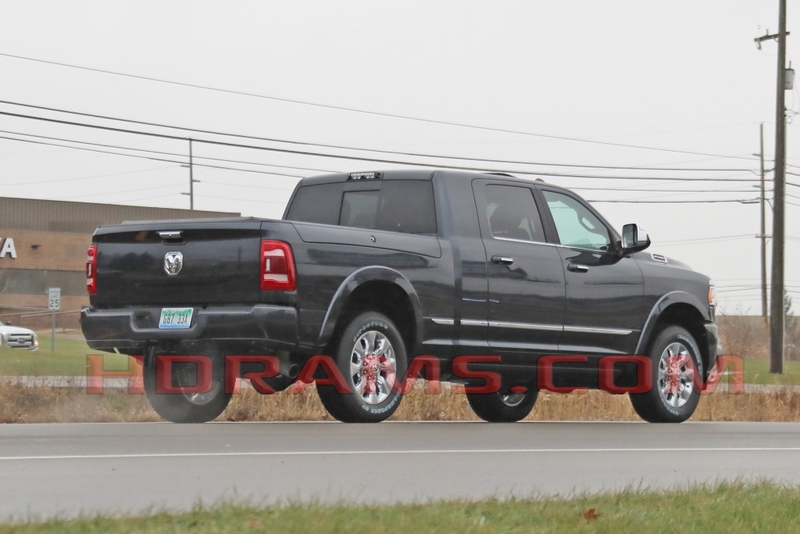 A new tailgate gets the updated Rams head badge that debuted on the 2019 Ram 1500, the tailgate also looks to have an electronic release mechanism and a new body line that matches that of the 2019 Ram 1500. 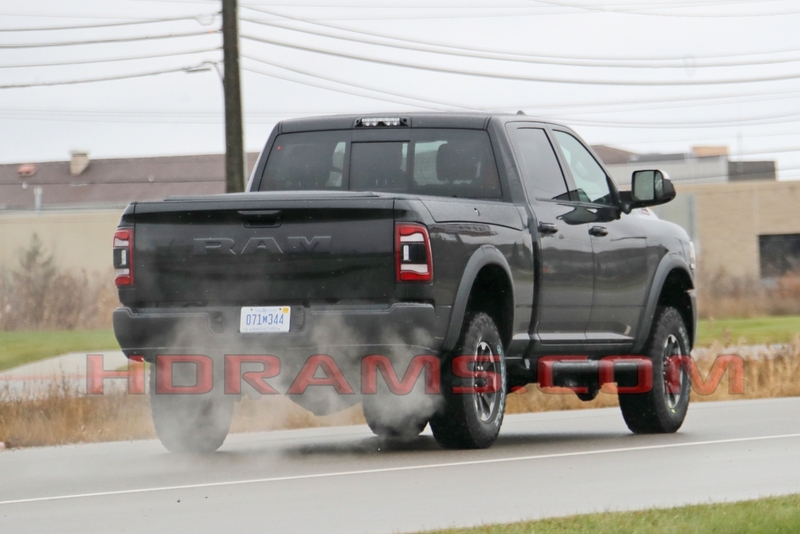 New LED taillights are similar to the 2019 Ram 1500s but in a different shape as these trucks still, use the current style 4th gen box. 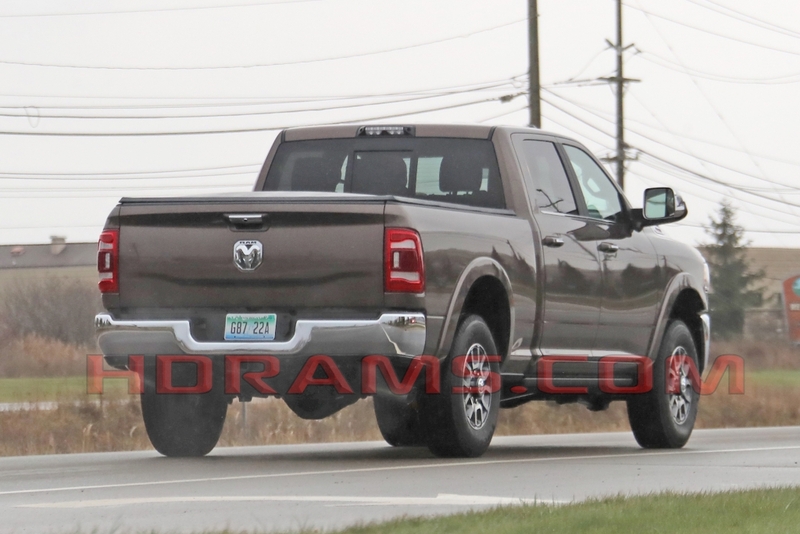 We can also see a new rear bumper with a lower step-up height across the width of the tailgate. 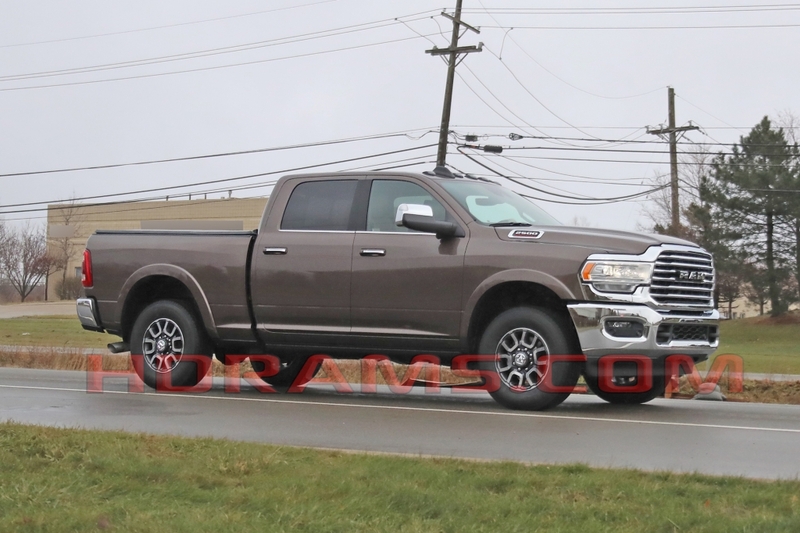 Alongside the truck we can see that the tow mirrors have finally been updated and have side view cameras incorporated into them, these trucks also get redesigned fender flares as well as power-deployable running boards as an option and possibly standard on higher trims. 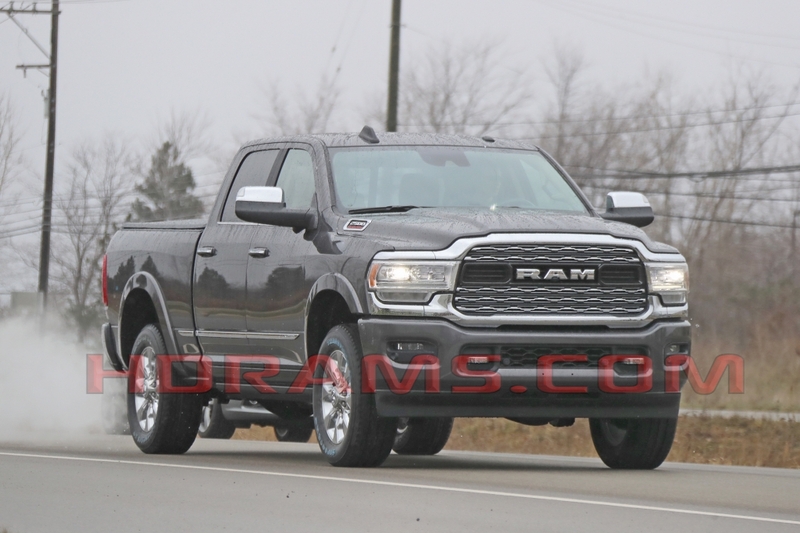 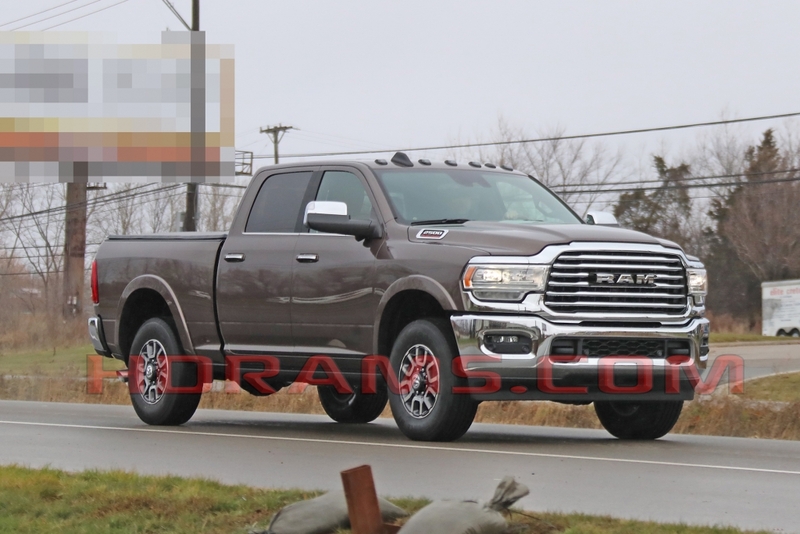 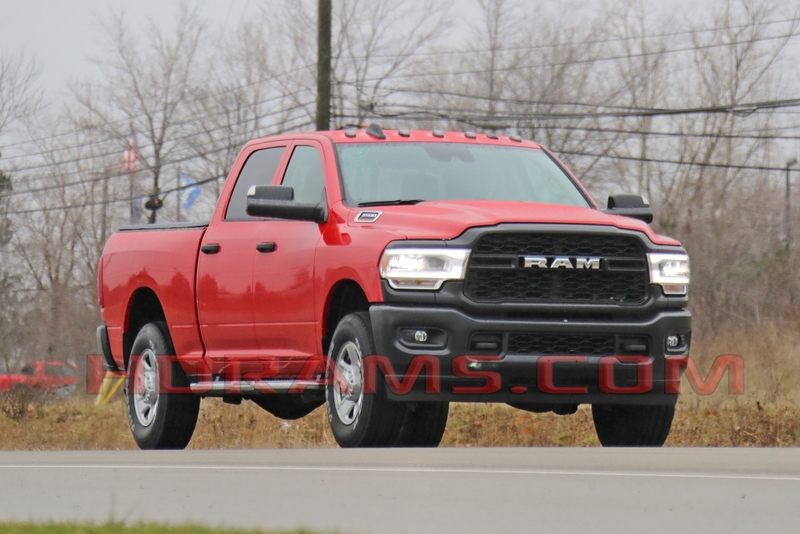 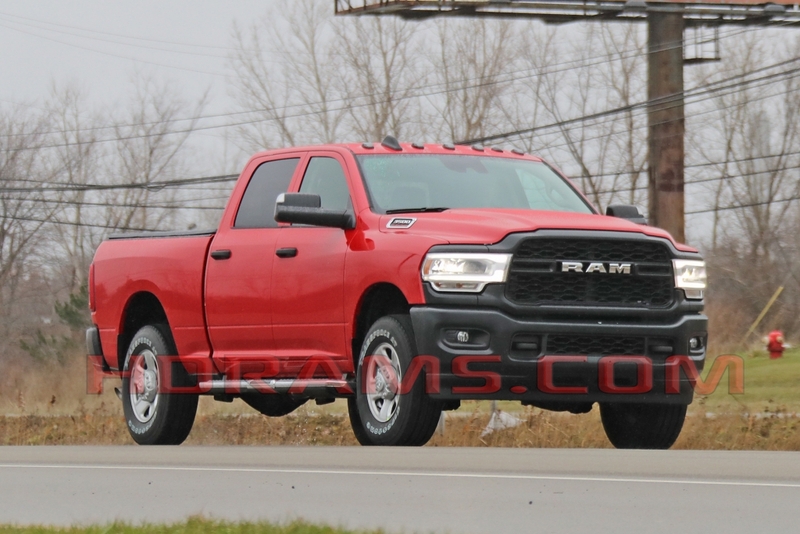 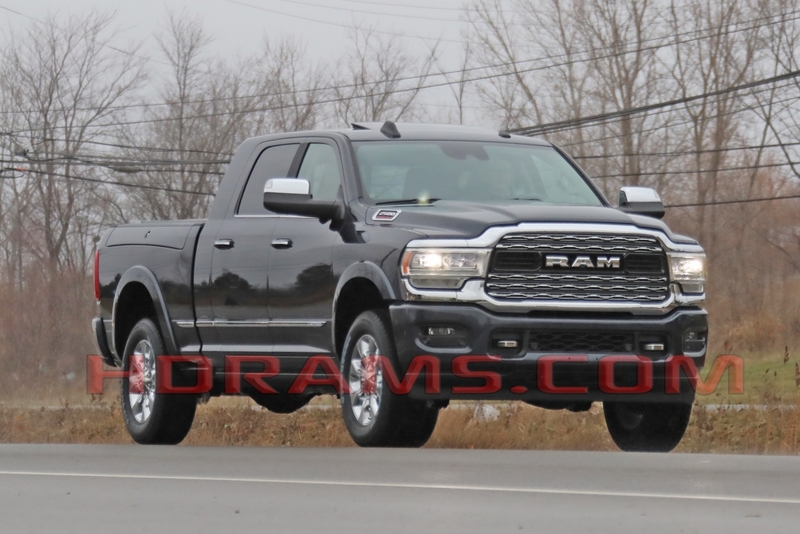 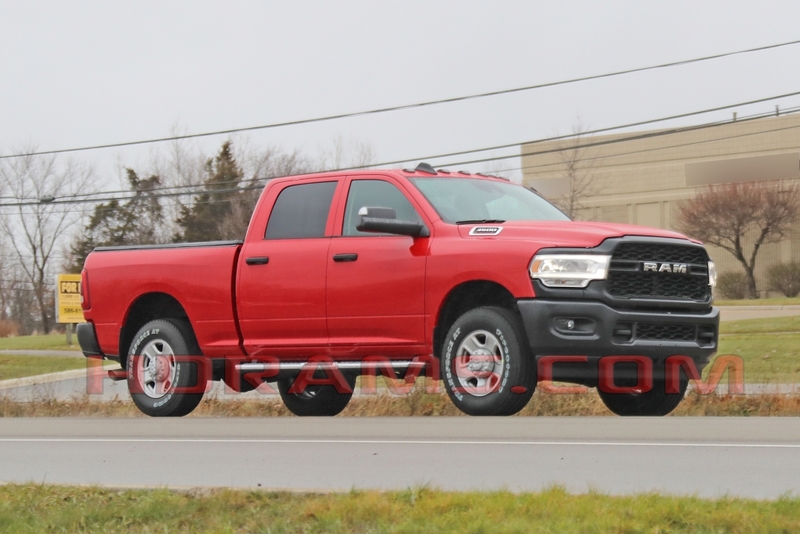 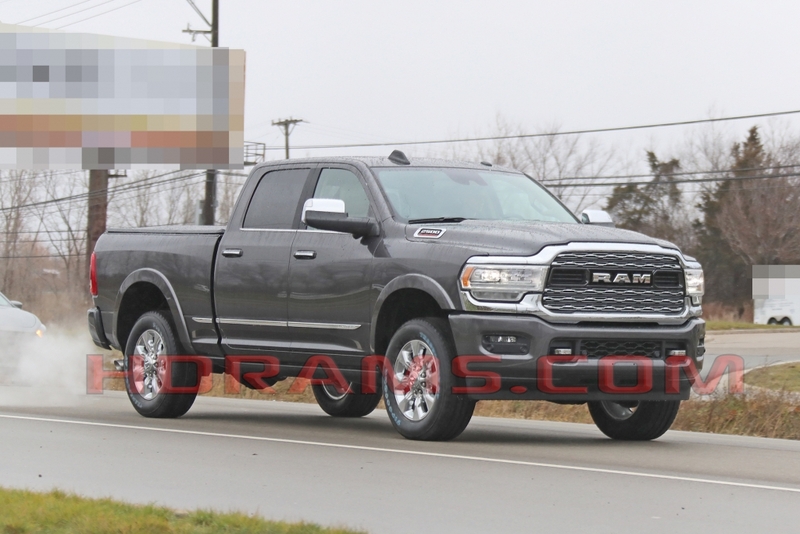 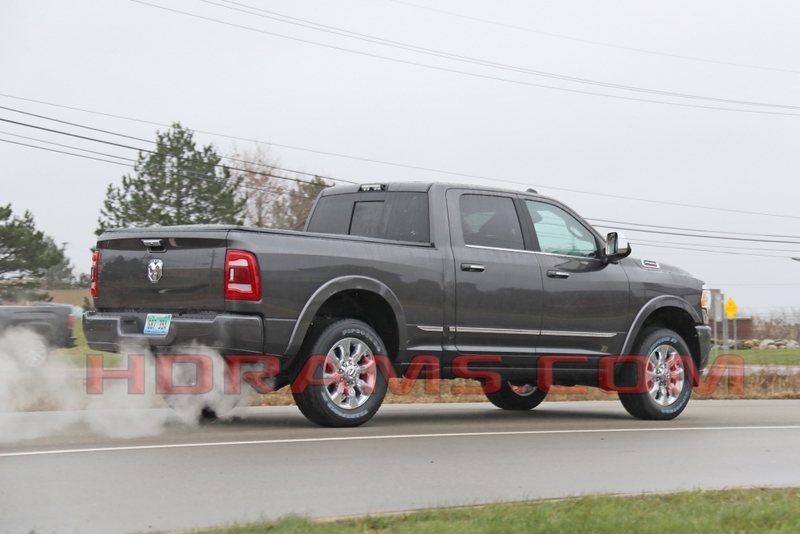 As we were the first to report the cabs and boxes remain the same as the current 4th Gen HDs but the interior will be all new in line with 2019 Ram 1500 and the trucks should debut all the new technology that the 2019 Ram 1500s debuted and possibly more. 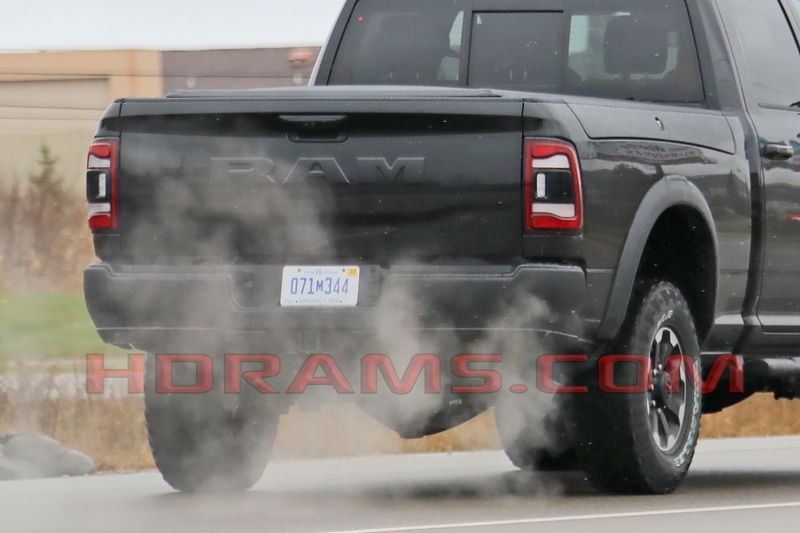 The 2019 Ram HDs will officially debut at the North American International Autoshow in Detroit next month and we will be there. 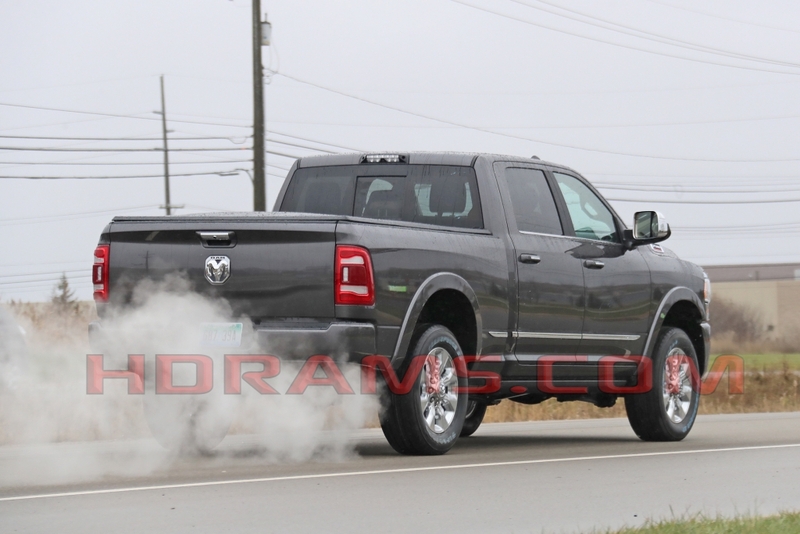 Stay tuned for all the latest Ram HD news and information. 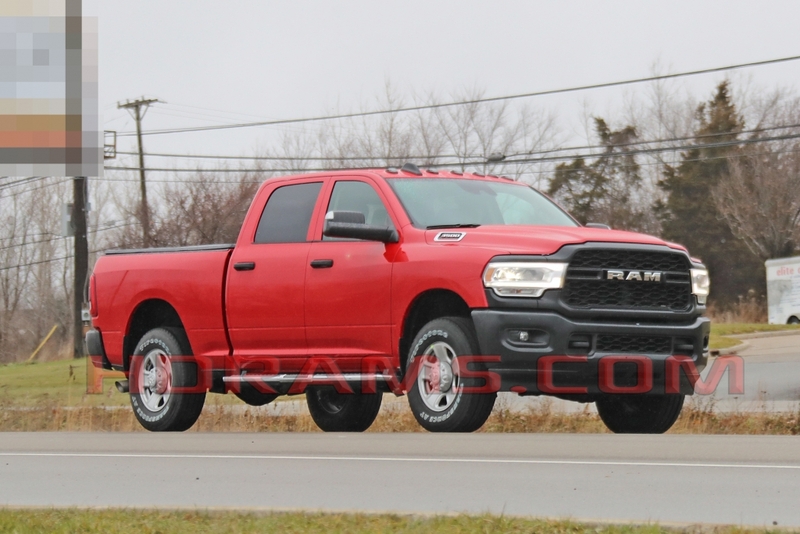 Editors Note: We fixed the gallery for those on mobile devices who were having issues with the picture gallery. 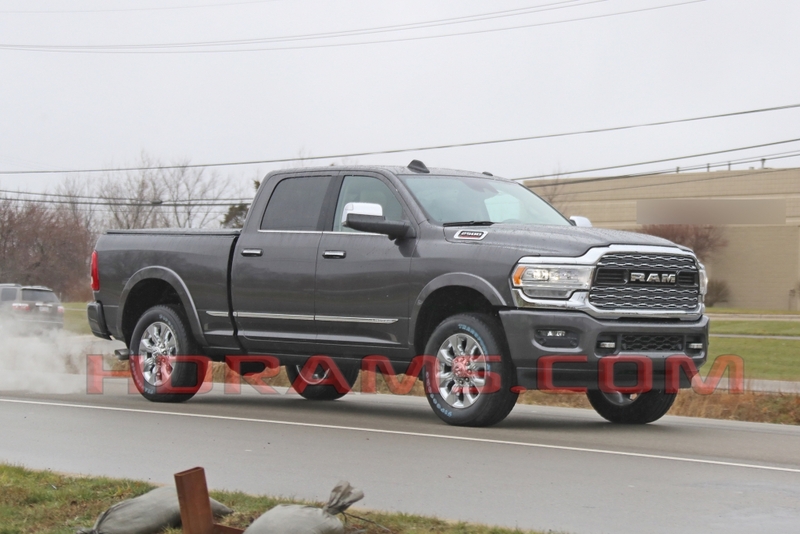 (12/5/2018).